BLACK AMIGO MOUSTACHE 1/pkg. - self - adhesive (use of spirit gum is recommended for extra hold) Looking for the perfect moustache for your costume this year or a great way to go incognito; then this moustache is perfect for you! 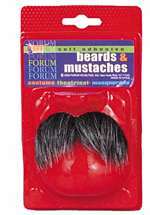 This self-adhesive moustache is a quick and easy way to add the perfect touch to any ensemble.